What could possibly be more fun than a real sounding train for your child? A train that your little engineer can ride! The new Choo Choo Express by Peg Perego offers sound effects, a driving wheel, and a circular track for hours of fun. 1 ½ to 3 year olds love to feel in charge, and steering their own train around the track is one way to accomplish this safely. The totally enclosed wiring, motor and gearbox keep little hands safe. 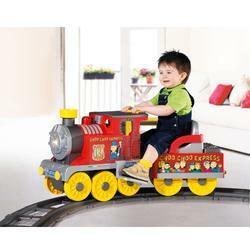 Powered with a rechargeable 6-volt battery, the Choo Choo Express train is designed for hours and hours of fun. Made in the USA.